No matter what you listen to -- movies or music, in two or many channels -- a subwoofer is a likely addition to your audio system. Back in the old days, the most prominent name in subwoofers was Velodyne; very few speaker manufacturers had jumped into the fray. Nowadays, subwoofers are more common than sunburns on tourists in Hawaii, and everyone makes models from the cheap to the expensive. But with so many choices, separating the wheat from the chaff gets tougher and tougher. 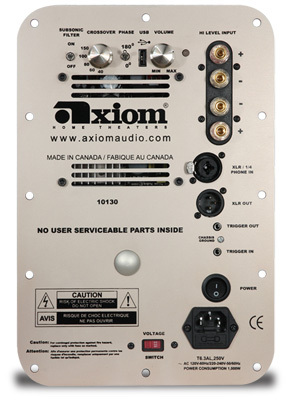 One manufacturer of a whole gamut of subwoofers is Axiom Audio, an Internet-based company located in Dwight, Ontario, Canada, in cottage country three hours from Toronto. They’ve been around for 30 years now, making a complete line of speakers, amps, and subs. At a base price of $2350 USD, the EP800 v3 is their most expensive subwoofer. At 45.5”H x 15”W by 17”D and weighing 110 pounds, Axiom’s EP800 v3 is the biggest piece of audio gear I’ve ever had in my system. And it dwarfed the small towers I used it with by more than a foot, which made it look even bigger. (If the EP800 proves too imposing, Axiom makes a horizontal version that can be placed behind a couch.) The tapered cabinet is 15”W in the front and 12”W in the back. According to Axiom, this shape acts to reduce standing waves inside. The edges of the cabinet are chamfered to cosmetically match Axiom’s other speakers, and also made it easier on my hands to move this beast around. 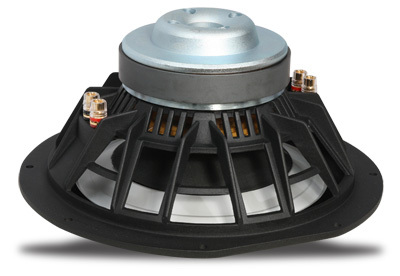 Two 12” aluminum cones are centered vertically on the EP800 v3's front panel. Rather than one passive and one active cone, as is often seen in other designs, both of these are driven by the EP800’s amplifier, and have massive dual voice-coils for high power handling. 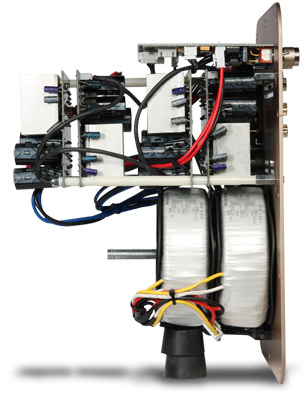 The EP800 is a sealed design; there are no ports or openings anywhere in its cabinet. The electronics consist of an Axiom-designed analog power supply and digital amplifier rated at 800W RMS. Conventional digital switching power supplies can distort when the amplifier demands large swings of current; but with an analog power supply, the digital amp driving the woofers has plenty of headroom for dynamic peaks, according to Axiom. In addition, an XLF (for eXtended Low Frequency) DSP chip is programmed to correct, within +/-1.5dB, any deviations from linear response. In other words, the EP800 shouldn’t distort, no matter how loud it’s cranked. The control panel has speaker-level inputs, balanced XLR input and output, 12V in and out triggers, a volume control, and a crossover knob with a continuous range of 40-150Hz. The balanced XLR input doubles as an RCA input, and Axiom provides an adapter to allow a standard RCA interconnect to be plugged in. You can toggle the phase from 0 to 180 degrees, and switch in a subsonic filter to cut off the response below 20Hz. I received two different versions of the EP800. The first, from Axiom’s custom VaSSallo Series, had a gorgeous finish of high-gloss piano-black so shiny and smooth I could see my reflection in it. This finish costs an extra $1150. Axiom also offers many real-wood veneers in high, semi-, and low gloss, and can match any custom finish. This level of customization is unprecedented for such reasonably priced subwoofers and speakers. During the course of my listening the EP800 underwent an updating, and Axiom sent me the new version, the v3. This came finished in standard Black Oak, a high-quality matte vinyl. The v3 updates include cooling vents for the amplifier, and a magnetically attached grille. I’m aware of three trends in the pursuit of deep bass: 1) medium-size box, port, small amp; 2) small box, no port, big amp; and 3) big box, no port, big amp. The reasoning behind each is logical. The first type is the most common; a medium-size cabinet needs a port to enhance its bass output, and can be driven with a relatively small amp. The second type is the latest trend: small, spouse-friendly subs that can be tucked into a corner, out of the way. They can produce remarkable bass from their small, sealed cabinets by driving the crap out of a small woofer with a big amplifier. Often, they have two passive drivers to enhance bass quantity. One of the design challenges of this type is that the woofer has such long excursion that truly linear motion can be difficult to maintain, and the result can be increased distortion. The third and least common trend is putting a big driver in a big box. This way, deep bass is achieved by virtue of cabinet volume; the driver doesn’t have to move as much, and so can be driven by a smaller amp. Axiom has taken this design approach to an extreme in the EP800 v3, which achieves deep, subterranean bass with a huge cabinet, huge amplifier, and huge drivers! Because of the EP800’s sheer size, finding a suitable spot for it can be problematic. I recently moved, and my new basement listening room is 23’L x 16’W, with an average ceiling height of 8’. Because my projection screen and main speakers are along the long wall, I have lots of places along that wall to place a sub. I ended up putting it in the front, about 7’ from the left sidewall, which gave the EP800 plenty of room and no chance of interfering with my mains. For the best blend of its output with that of the main speakers, the EP800 should be paired with towers with some semblance of bass response of their own. When I tried the EP800 with small on-wall speakers, getting a seamless transition from speakers to sub was challenging, to say the least. The best sound I had in my room was with Monitor Audio’s Silver RX6, a small tower with decent bass response down to 50Hz or so. I set the subwoofer crossover in my Integra DTR-8.8 A/V receiver to 60Hz, to let the EP800 do its thing below that frequency. I played a few of my favorite CDs and was underwhelmed. Where was the bass? The EP800 proved to be the deepest-playing, most powerful subwoofer I’ve ever heard. I pulled out a recording with the deepest bass I know: Mussorgsky’s Pictures at an Exhibition and Stravinsky’s Three Dances from Petrouchka, with Jean Guillou performing his own transcriptions of these works for pipe organ (CD, Dorian DOR-90117). I experienced wall-shaking bass that rattled my light fixtures. During the frequent spates of the lowest pedal notes, the movement of the air was incredible -- I could feel it 10’ away! It is in these lowest notes that you feel the music with your body more than you hear it in your ears. Another album with decent bass, though not in the lowest territory of organ music, is Holy Cole’s Temptation (CD, Alert Z281026). The bass in such tracks as “Train Song” often sounds overripe and boomy through many subwoofers and tower speakers. This is one track that’s difficult to reproduce just right, and I often use it when positioning main speakers and subs in my room. But with its clean, tight bass, the Axiom excelled. Since the Monitor Silver RX6 speakers don’t go very deep, the EP800 essentially filled in the lowest notes without intruding on the upper bass, which made for a formidable combination. The bass was tuneful, and it was easy to distinguish individual notes plucked by bassist David Pilch’s deft hands. If I had any remaining doubts that the EP800 v3 was a fantastic subwoofer, they were laid to rest when I listened to SuperBass 2, a double-bass trio of Ray Brown, Christian McBride, and John Clayton (SACD, Telarc SACD-63483). I didn’t know that three bassists could be so melodic, but this disc is a superb demonstration of the instrument. The EP800’s 12” drivers got quite a workout during “Papa Was a Rolling Stone,” moving furiously to keep up with the music. The deepest bass remained distinct and clear, with no muddying of notes -- a gratifying performance that ranks with those put on by the very best subwoofers I’ve heard. Although the focus of SoundStage! is two-channel audio, but I’d be remiss if I didn’t mention how the EP800 v3 performed in a home-theater system, since many buyers will use it for that purpose. Once again, “Wow!” I was particularly impressed with its reproduction of the low end of Drumline. In the extended, final showdown scene on the Blu-ray edition, the percussion sections of the various marching bands battle it out -- this is one scene where you really want to crank up the volume. It’s difficult for any system to reproduce the impact of the bass drum, but the EP800 v3 came closer to that reality than I’d heard in my room. Watching this scene, I could feel the air moving across my legs. This sort of experience is the source of the audiophile term pants-flapping bass. The EP800 v3 provided a lot of it. Although I didn’t have a single $2000 subwoofer on hand to compare the Axiom EP800 v3 with, I did have two Definitive Technology SuperCube IIs, which retail for $899 each. This made for an interesting comparison: one huge sub vs. two tiny subs of the small box, big amp type. The SuperCube II has one active 8” woofer driven by a 1250W amp, and two passive 8” cones, all in a box whose largest dimension is 12.5". Four SuperCube IIs can be stacked in about the same amount of space occupied by a single EP800 v3. Was this a case of Davids vs. Goliath? Not quite. In most rooms, two subs will usually sound better than one. That’s because bass frequencies will have peaks and nulls throughout a room, and you may be sitting in a null. If so, no amount of equalization will raise that null; no matter how much you crank up your sub’s volume, your listening position will lack bass. Unfortunately, my listening seat is in a bass-null region. Being able to easily move two little SuperCube IIs around to various spots in the room evened out the bass response so I could then fine-tune it. In terms of décor, I’d have preferred to put the EP800 v3 in the right front corner of my room, but that didn’t provide satisfying bass at my listening seat. The final location was on the left side of my room; satisfying, yes, but not a visually practical location for the long term. But even after I’d optimized the positions of the SuperCube IIs, they couldn’t match the sheer output of one Axiom EP800. When I watched the Blu-ray edition of Avatar, which has tons of LFE effects, the impact and depth of bass from the Axiom sub was a notch higher than from the Def Techs. Where the SuperCube II combo worked better than the Axiom was with smaller speakers, such as Definitive’s own Mythos XTR-50 on-wall model. The SuperCube IIs’ smaller woofers were more adept at higher bass frequencies, which made for a better blend with these smaller speakers. This was evident on tracks such as the voices of Ladysmith Black Mambazo on Long Walk to Freedom (SACD, Heads Up HUSA 9109). With this 5.1-channel disc, I found the transition of voices from speakers to subwoofer less disjointed with the SuperCube IIs than with the EP800. If your room doesn’t offer placement flexibility, or is of medium size or smaller, think carefully about the Axiom EP800 v3, or consider some of Axiom’s smaller subwoofers. The EP800 really will dominate a room, and its ideal location for bass output may not be practical for you. I feel that two EP500 v2s, Axiom’s smaller but still powerful DSP subwoofer, would be ideal for me. But if you have a large room and you’re in the market for a cost-no-object subwoofer, then give the Axiom Audio EP800 v3 a listen. It competes with subwoofers that cost several thousand dollars more, and might just save you a ton of money. And it will provide extremely deep and powerful bass that takes a back seat to no one.